One Personal Fundraiser. Six Lives Changed. 03 Jul One Personal Fundraiser. Six Lives Changed. Ayanna may seem like an ordinary 14-year-old girl from Cranberry, New Jersey, but she is anything but ordinary… she’s extraordinary. 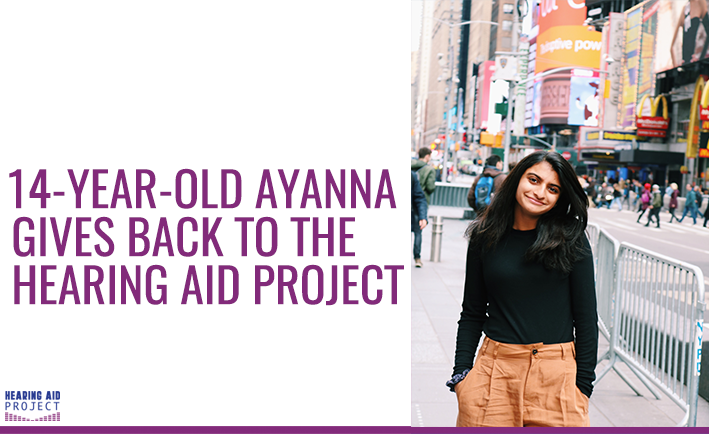 Aside from breaking the Hearing Aid Project’s personal fundraising record, Ayanna has now impressively raised $3,032, which has changed the lives of six individuals. Her story is quite remarkable. At the age of six months old, Ayanna was diagnosed with severe to profound hearing loss. As a child she received a cochlear implant and a hearing aid, which have allowed her to grow, develop and communicate effortlessly with those around her. Ayanna is extremely appreciative for the assistance she received as a child. Her personal journey is ultimately what inspired her to give others the gift of hearing. Thanks to her father, Ayanna found the Hearing Aid Project online and created a personal fundraiser. Growing up, she remembers receiving unconditional love and support from her family. Even now, they have remained some of her biggest cheerleaders and donors. In just a few simple steps, you can create a fundraiser like Ayanna and give someone a moment they will never forget – hearing the voices of their loves ones again. Ready to get started? Create your personal fundraiser today! Invite your friends and family to support your cause. Every $500 raised provides a person in need with hearing aids. If you are interested in supporting Ayanna, you may also donate to her fundraiser!